May help to stabilize the thigh whilst the lower part of the cast is wrapped and moulded. Cast is extended above the knee high into the groin and the knee set at 90 degrees flexion. Babies who are in the corrective phase of treatment will need cast removal every time they attend the clinic. The Ponseti method consists of a specific technique of manipulation of the clubfoot deformity, followed by the application of a plaster cast with the foot in the corrected position. A percutaneous tenotomy of the Achilles tendon is done prior to the final cast to gain complete correction in most patients. Bracing with a foot abduction orthosis is necessary to minimize relapse of the deformity. This video provides a demonstration of doctors casting a baby with club feet using the Ponseti Method. ↑ 1.00 1.01 1.02 1.03 1.04 1.05 1.06 1.07 1.08 1.09 1.10 1.11 1.12 1.13 1.14 1.15 Africa Clubfoot Training Project. Chapter 6 Africa Clubfoot Training Basic & Advanced Clubfoot Treatment Provider Courses - Participant Manual. 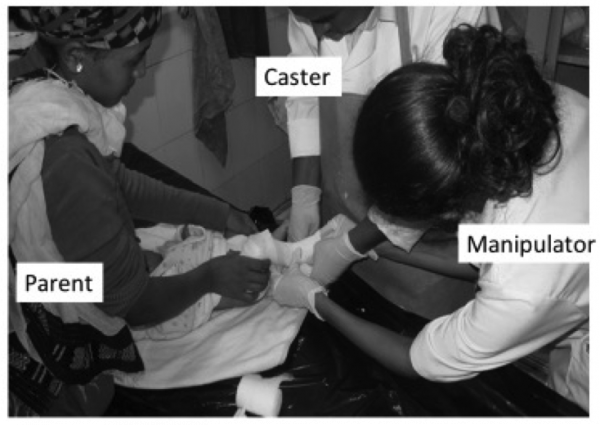 University of Oxford: Africa Clubfoot Training Project, 2017.